As it turns out, Donald Trump was not the most controversial aspect of this year’s Miss Universe pageant. Lots of things can go wrong in the lead up to the final declaration. Dresses can catch on high heels and split all over the place. Talent competitions can go awry. Even the most well-prepared ladies can flub their carefully rehearsed answers to interview questions. What people don’t expect is for the biggest mistake of the night to come from the host, but that’s exactly what happened. During Sunday evening’s most climactic moment, Steve Harvey read the card wrong. 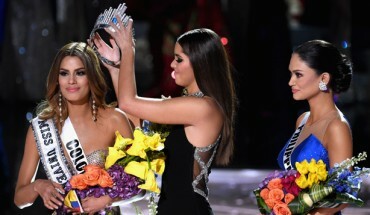 Instead of announcing the pageant’s rightful winner (Miss Philippines, Pia Wurtzbach), Harvey’s mouth went with a different candidate (Miss Colombia, Ariadna Gutierrez Arevalo). Whoops. Here’s that fateful card, if anyone needs further evidence that Harvey (and no one behind the scenes) made an oopsie.